PSA chief Varin will speak at the ANE Congress. 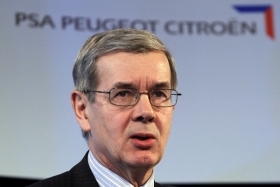 PSA/Peugeot-Citroen's alliance with General Motors Co. and the French company's troubles in Europe will be in focus when PSA CEO Philippe Varin speaks at the upcoming Automotive News Europe Congress. Varin is one of a number of key executives speaking at the 15th ANE Congress, which will be held in Monte Carlo on June 20-21. The Congress will explore the industry's toughest issues and provide some solutions. This year's theme is "Building Resiliency in Turbulent Times — Managing the Unexpected in an Age of Complexity." Among other scheduled speakers are Renault Chief Operating Officer Carlos Tavares, Opel/Vauxhall CEO Karl-Friedrich Stracke, Porsche CEO Matthias Mueller and Volvo Cars CEO Stefan Jacoby. Ferrari Chairman Luca Cordero di Montezemolo will be the keynote dinner speaker.